Each year I try to come up with an interesting holiday dressed coach to lift our spirits for the coming joyous season. For 2013 the winner is a 1952 44 passenger GM Coach Model TDH 4509 and one of five likenesses numbered 355 to 359 delivered to Northern Indiana Transit, Inc., of South Bend, Indiana. Our focus is conservatively attired as compared to the more lavish displays we've seen in the past but still makes its point in bringing cheer to all as it heads to St. Mary's College in the South Bend suburb of Notre Dame. Merry Christmas and Happy Chanukah to all and to all a good night! 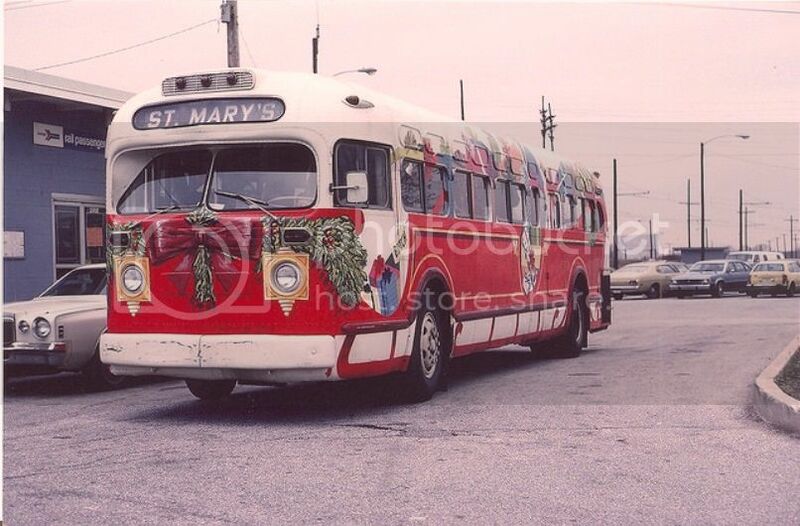 Photo courtesy of 'Flickr - The Old Look Bus Pool' and was taken by Bruce K.
Best wishes to you too, Mr. L! I think all of us at BTN owe you a lot of thanks for all you do here! Happy Holidays Mr. Linsky, Bob and every one else at Bus talk. As Bob Newhart used to say; "Same to you fella"
Happy Holidays to all and a Happy and Healthy New Year. And Merry Christmas, peace on earth to you Mr. Linsky. Sitting in front of the Amtrak/South Shore Line depot out at Bendix Road on the west side of South Bend. I'm suprised that the private company was around long enough to see Amtrak.